Reading the Fantastic Four comics from the start. 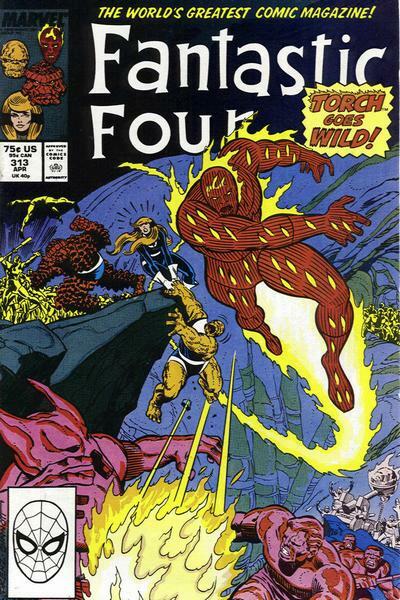 Issue #313 begins a multi-part story that will see the new FF — Ben, Johnny, Crystal, and the Sharon Ventura Ms. Marvel — visiting some of weirdest, wackiest corners of the Marvel Universe. To begin, we’re heading back into the world of the Mole Man. We begin with the new FF visiting Project Pegasus. This is a crazy sci-fi science lab where Ben had a series of adventures when he was the star of Marvel Two-in-one. They’re greeted by the lab’s new leader, Dr. Devere, an ominous man who gives Crystal the creeps. Ben explains that the FF are searching for the Mole Man, and want to check out the tunnels beneath Project Pegasus. We then get more info in a flashback, sort of. 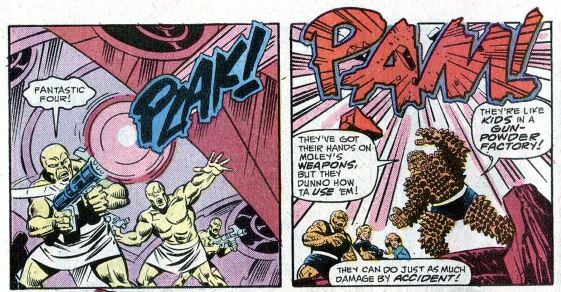 We see Ben upset about Dr. Doom placing hidden cameras inside their headquarters, and from there he makes an odd leap to try to contact the Mole Man and convince him the surface world isn’t so bad. The FF enter the tunnels, with a lot of talk about running into lava men. Instead, they’re confronted by the Mole Man’s Subterraneans. There’s a brief fight, which ends when Johnny uses bright flame to stun the Subterraneans’ weak eyes. The Subterraneans say that the Mole Man has departed his underground kingdom, leaving them leaderless. They further say they are at the mercy of vicious lava men, and another underground tyrant, appropriately named Tyrannus. Our heroes go deeper underground, running to Tyranoids, a tougher breed of Subterranean loyal to Tyrannus. Ben and Crystal work together to destroy the power source that fuels all the Tyranoids’ weapons, and the fight is over. They learn that the Mole Man stole a suit of armor from the Tyranoids, after which he went even deeper underground, where the heat is almost unbearable. The FF follow, with Crystal promising that she use her powers to keep the heat from overwhelming the team. 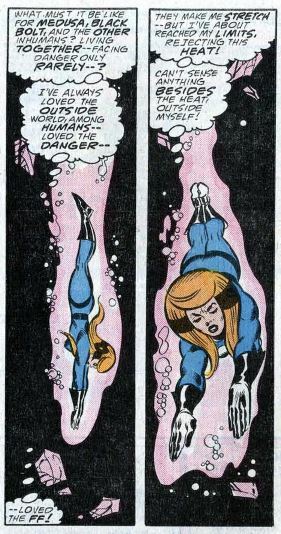 Crystal uses her elemental powers to dive into the molten rock and swim down in search of the Mole Man. She fights a lava man down there, and then has to escape by expelling moisture from her mouth. This propels her out of the lava somehow. (Any scientists out there care to weigh in on this one.) She is unconscious, and Johnny heals her by drawing the heat out of her and into himself. Ben and Sharon tough it out this whole time, smoldering as the tough out the heat. Johnny seals up the molten rock pit, and our heroes leave. 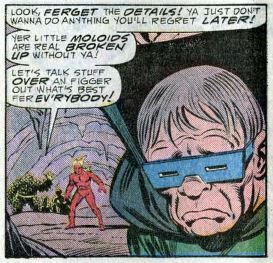 Clobberin’ time: Ben’s friendship with the Mole Man came from issue #296, in which Ben was a bigwig living in the Mole Man’s kingdom for a while, just before he rejoined the FF. Flame on: During the fight, Johnny references being just like Dwight Gooden. I googled it: Gooden is a former MLB pitcher who had a 16-year career pitching for a bunch of different teams. I’ll assume the lava men are to blame for him being so sweaty on his Wikipedia page photo. Fantastic fifth wheel: Crystal again proves herself to be ridiculously powerful. She can swim through molten rock! That’s, like, Hulk-level action. 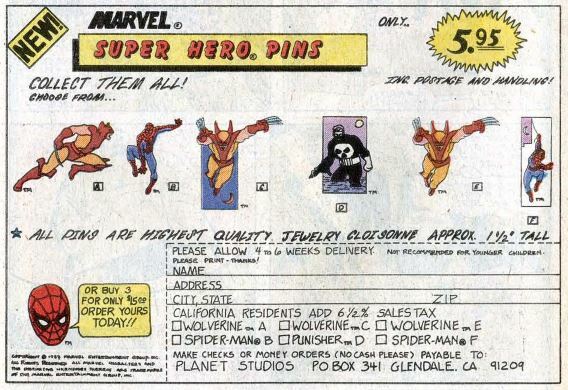 Commercial break: I always wanted one of these pins. They’re the highest quality jewelry cloisonné! Trivia time: Who’s this Tyrannus guy? He’s an old-school Hulk villain, dating all the way back to the Hulk’s fifth appearance, most recently seen in Incredible Hulk #243. We even saw him briefly back in Fantastic Four issues 126-128. I suppose name-dropping him in this issue to show how both he and the Mole Man can both have giant underground kingdoms. Fantastic or frightful? I’ve done some reading ahead, and this arc will go into some truly bizarre places. (Remember the Beyonder?) This issue, though, has a lighter, old-fashioned “let’s go an adventure” feeling to it, making it a nice change of pace from the uncomfortableness of the previous issues. Next week: Still more underground action.